DAQ device users responsible for connecting analog input signals for accurate measurements. If you are already familiar with these concepts, you can proceed directly to TechTip: Basic Analog Signal Connections (Part 2). A typical DAQ device provides a choice of single-ended or differential analog input channels. Single-ended inputs measure the voltage between the input signal and analog ground (AGND) (see Figure 1). Because they require only one physical connection per input, a single-ended configuration can monitor twice as many channels than the two-connection differential configuration using the same connector and onboard multiplexer. Differential inputs measure the voltage between two distinct input signals (see Figure 2). A differential input better resists electromagnetic interference (EMI) than does a single-ended input. Most EMI noise induced in one lead is also induced in the other. The DAQ input measures only the difference between the two leads, and the EMI common to both is ignored. This effect is the major benefit of twisted pair wiring – the twisting ensures that both wires are subject to virtually identical external influence. The main difference between a single-ended or differential input configuration is the common connection, or common mode voltage, for the analog voltage inputs. Single-ended multichannel measurements require that all voltages be referenced to the same common node to prevent certain types of measurement errors. For most single-ended DAQ systems, the common reference must be earth ground as established by the computer, which makes the measurement vulnerable to both EMI and any ground noise at the signal source. 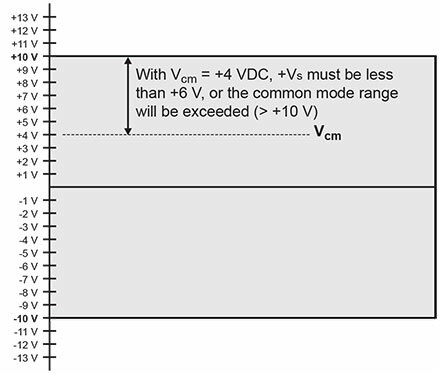 Figure 3 shows a single-ended configuration with a common mode voltage (Vcm). 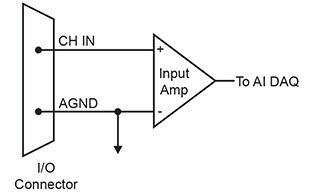 Any voltage difference between grounds g1 and g2 shows up as an error signal at the input amplifier. If an ideal common point is not available for single-ended inputs, a differential input configuration is needed. A differential input configuration is more immune to EMI than a single-ended configuration because differential connections cancel or ignore common-mode voltages and can measure the difference between the two connected points. The rejected common mode voltages can be steady dc levels or noise spikes. Vcm is ignored in a differential input conﬁguration, but only within a range called the common mode range. 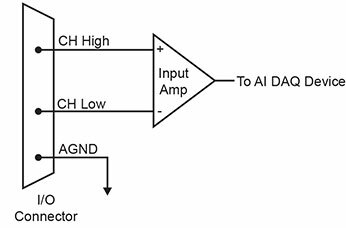 Typically, a device ampliﬁer in differential mode has a common mode range of ±10 V. The common mode voltage combined with the signal voltage – Vcm + Vs – must remain within this range. The common mode voltage range of ±10 V is shown graphically in Figure 5. An input signal cannot be measured if it is more than 10 V from the device AGND, even in differential mode. For example, the device cannot measure the difference between 13 V and 14 V as 1 V due to the ±10 V common mode range limitation. If the device input and the signal source have a common ground, then the signal source can be connected directly to the device. If the device input and the signal source have an offset voltage between their grounds (AC and/or DC), then this offset is the common mode voltage. Depending on the magnitude of this voltage, you may be able to connect the device directly to your signal source (this scenario is explained in the section Systems with Common Mode (Ground Offset) Voltages. If the device and the signal source already have isolated grounds, then you can connect the signal source directly to the device. In the simplest case, the signal source has the same ground potential as the device. This typically occurs when providing power or excitation to the signal source directly from the DAQ device. If you set up the system assuming there is a common ground, any voltage between the device ground and the signal ground is a potential error voltage. If the signal source or sensor is not connected directly to an AGND pin on your device, assume that you do not have a common ground even if your voltmeter measures 0.0 V. Configure your system as if there is ground offset voltage between the source and the device – especially if you are using high gains. Ground potentials in the sub-millivolt range are large enough to cause errors, but may not be measured by your handheld voltmeter. The most likely grounding scenario involves grounds that are somehow connected, but have offset voltages between the device and signal source grounds. This offset voltage may be AC, DC, or both. The offset can be caused by various factors, such as EMI pickup or resistive voltage drops in ground wiring and connections. Ground offset voltage is a more descriptive term for this type of system, but the term common mode is more frequently used (and is therefore used in this article). Small common mode voltages: If the voltage between the signal source ground and device ground is small, the combination of the ground voltage and input signal does not exceed the allowable ±10 V common mode range. Specifically, when you add the voltage between grounds to the maximum input voltage, the result is within ±10 V. This input is compatible with the device, and you can connect the system in a differential configuration without additional signal conditioning. Fortunately, most systems fall into this category and have small voltage differentials between grounds. Large common mode voltages: If the voltage between the signal source ground and device ground is large enough, the combination of the ground voltage and input signal exceeds the allowable ±10 V common mode range. In this case, do not connect the device directly to the signal source. Change your system grounding configuration or add isolation signal conditioning. Contact our technical support group to discuss signal conditioning options (refer to More Information at the end of this article). Caution! Avoid using the earth prong of an AC power outlet for signal ground connections. Different ground plugs may have large and potentially dangerous voltage differentials. Remember that the ground pins on 120 VAC outlets on different sides of the room may only be connected at the circuit breaker panel. This leaves the possibility that the ground pins may have a significant voltage differential — especially if the two 120 VAC outlets happen to be on different line phases. Some signal sources are already electrically-isolated from the device. Figure 6 shows a typical isolated ground system. These signal sources are often battery-powered, or are complex equipment. Isolated ground systems provide excellent performance, but require care to ensure optimum performance. Refer to TechTip: Basic Analog Signal Connections (Part 2) for more details. Please contact Measurement Computing Corporation if you have any questions or if you would like any further information. Additional TechTips are available on our Data Acquisition Technical Articles web page.